We have a great classes and events coming up! This Sunday we have classes in Chocolate and Gumpaste Flowers. Tami Utely will be visiting our classroom from California. You have to check out her website and come to her incredible classes in November (http://sugarartbytami.com/). We have listed amazing sugar artists aroundFlorida that are teaching and upcoming events. If you would like your class or event listed please email us and we’ll be happy to spread the word. We hope to see everyone on Oct. 23 at the Florida ICES Day of Sharing inJacksonville! Until next time, Keep Life Sweet! The real date for the Florida ICES Day of Sharing is 6/26! Sorry about the confusion! I’m getting ready to attend the Brevard Cake Artist’s Club meeting in Melbourne today. We are planning for the Florida ICES Day of Sharing 6/26/11 and today’s demo will be by Maria on Henna Cake Art. Next month we are meeting a week early because of Mother’s Day and we’ll be learning roses and monkeys. Should be a lot of fun. We had a full month starting with the Florida ICED Cake Competition in Ocala. Lisa and Melanie worked so hard and it was a huge success. It started at 8am with competitors lined up out the door to sign up! They had categories for novice, advanced, and professional as well as cupcakes and accessories. Tina’s cake with the doggy topper was fantastic! Amita, who is now in our Cake Club, won 1st prize in the advanced category for her beautiful Indian Wedding Dress Cake. Maria’s cupcakes were beautiful wedding bouquets and were sangria flavored. They were yummy with goat cheese icing! I got to take only one great class, Edna’s, and it was all about making gumpaste flowers without cutters. I had hoped to take more, but we were vendoring all day. We had 5 members of the BCA club attend! Rosann helped us out at the Booth and we had a great time going to Cracker Barrel over and over! LOL! It was close to the hotel and we could walk. Merrie Lee Reese ran the kids corner and Mercedes and Rebecca gave more classes. It was an incredible day that we heard was attended by 300 people and had dozens of wonderful volunteers. What a success! It was great to see all our cake friends and meet new ones! Next year it will be a 2 day event with a theme of Marti Gras. Can’t wait! Check out their website at http://www.floridaiced.com. Simi had a fun cake month with purses, baby showers, birthdays, and donations. The classes have been going great. You can check out the schedule on http://www.simicakes.com for more information. We are adding mold making classes next. Our online store is still getting started, but you can see some of the items and call in for orders for now. We hope to see everyone at the Florida ICES Day of Sharing 6/26. For more info check out the website at http://www.flices.org. And then it’s off to the ICES Convention in August! Check them out at http://www.ices.org! 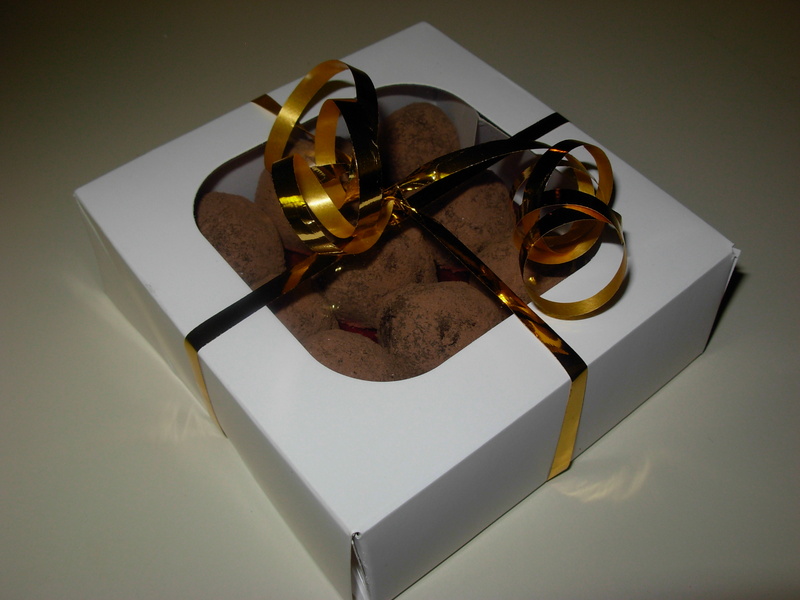 Luckily, “It’s All About Chocolate Extravaganza” was the same week I needed to create Bon Bons for Ecole Chocolate. I invented a few new flavors including Pom Green Tea, Caramel Sea Salt, Pistachio Pumpkin, and Honey Orange, along with a few classics like Coconut Butter Truffles. The Chocolate Extravaganza was very well attended. We had 300 come thru and try our chocolates and White Chocolate Challah Bread. The Crown Plaza was elegantly decorated and they raised money to support Livestrong and the Brevard Jewish Community School. This months classes were St. Patrick’s Day Cupcakes and a Molded Sugar/Isomalt Class. Coming up are classes in “critter” sculpting, pulled sugar flowers and vines, and bunny and lamb cupcakes. Check out the schedule on http://www.simicakes.com. Bonnie and Todd had a beautiful outdoor reception on the beach to celebrate their marriage. They had us create a cupcake and brownie seashell theme. We even included gluten-free cupcakes and brownies for the guests with special dietary needs. And Kelly hosted an open house for her office in Down Town Eau Gallie with the “Your Turn Key to the Community” theme. Next week we will be attending the Florida Iced Cake Competition in Ocala and donating door prizes to raise money for the Make A Wish Foundation. Stop by and say “hi”! The Extreme Makeover: Extreme Edition Viewing Party was held at the Cocoa Beach Hilton last Sunday. It was wonderful to see so many volunteers come out to wrap up the project. Lifestyle Homes and the Hurston family endlessly thanked everyone for all their support. It was a chilly evening, but great fun watching the entire production on the big screen. We served that last extreme cake. It was a Memory Pop-up Scrapbook with edible images and fondant elements to recreate the volunteers week together on the project. And since it was Valentine’s weekend, we brought along 300 chocolate hearts. The VW Bug cake is coming together nicely. I’ll be teaching a Filled Chocolates class Thursday and an Isomalt/Cast Sugar class on Sunday. Keep an eye out for upcoming classes on the website. Congratulations Hurston Family! It was a great week and a wonderful morning at your new home getting to meet you and present you with the cupcakes, chocolates, and gift certificate! Thank you for doing so much to help clean water around the globe. We would like to thank Jake Luhn, his wonderful family, and the Lifestyle Homes staff for bringing Brevard County together in this amazing project. It was an incredible honor to be part of something so positive for the community and help such a deserving family. A huge thank you goes out to Kate, Page, and Nick of Benedict Advertising in Daytona. You guys made our week smooth and seamless. You made sure we were always in the right place at the right time and we always felt like we were on top of the situation in all this chaos. Thank you Rosann for all your help this week. We never could have done this project without you. And thank you Jackie Powshok for all your help with cupcakes on the reveal day. It was a blast handing out cupcakes with you to all the Lifestyle friends and family. All in all, this week we made 10 deliveries, 1500 cupcakes and candies, 3 extreme cakes, and our live video feed was seen in more than 80 countries! It really was an extreme week! I hope you had a wonderful Christmas! It was a whirlwind! After many cakes, dozens of cupcakes, and hundreds of chocolate truffles we finally have a day of rest! It was a very exciting holiday season. I made a gluten free cake and a dozen gluten free cupcakes covered them with ganache and chocolate shavings. Another cake was completely sugar free chocolate with chocolate icing. 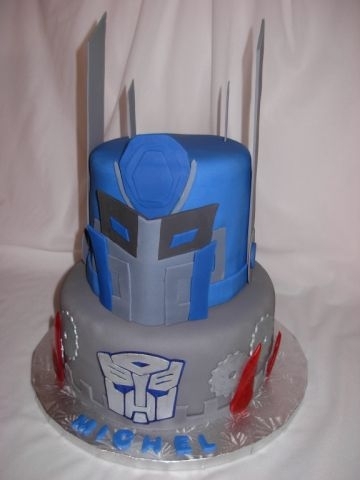 The cake that was so much fun to make was a Transformer’s themed cake for 11 year old Michel. The top tier was Optimus Prime’s helmet and I added his flames in cast sugar for a fun effect. 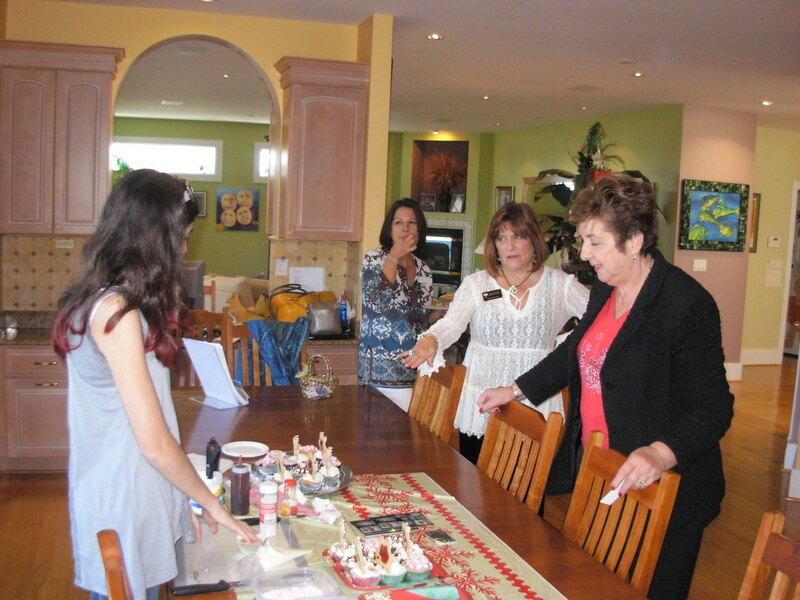 I was invited to demonstrate holiday cupcake making at an open house for Caryl Pomales of Re/Max Olympic. It was a beautiful house with the most incredible views of the ocean in Melbourne Beach. I had a lot of fun making peppermint patties, stained glass ornaments, and s’more cupcakes.